The latest Sneaker brand on the block, which is taking the footwear world by storm, is Buscemi. But with heavy competition from the sea of designer sneaker brands sweeping across the world, is their room for another? The Buscemi sneakers have a perfect structuring with simple yet standout colouring. The Buscemi name is emblazoned across the side of the shoe and tongue alongside the Made In Italy print. Hardware detailing with the signature tiny paddock complete with working key, similar to that of the Louis Vuitton Bag collection, make details like this rival the competition. All of their products are crafted in the same Italian factories as the very prestigious brands, sharing construction floor space with Chanel and Prada, among others. The brand, which has been called the Hermes Birkin of the sneaker world, in part due to its high demand and scarcity, produces very few sneakers at a time, just enough to stoke demand, increasing the allure of owning something very few do. Each time stock is replenished, it’s a race to get hold of a pair of Buscemi before they are quickly snapped up by savvy customers. But this is no accident, the brand has chosen this business ideology to increase its exclusivity and so far it is working. Many celebrities are falling over themselves to get hold of the latest pair before anyone else. 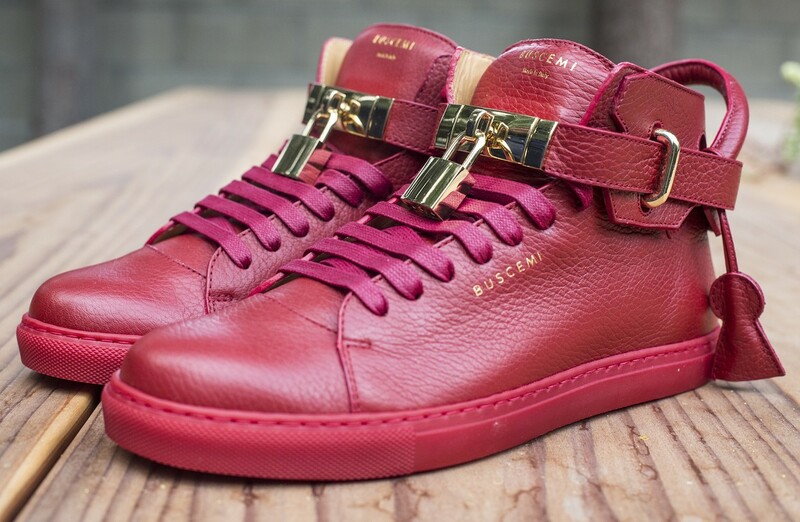 Check out our top Buscemi sneaker choices below!